Adelaide Trailer Hire offers a wide range of Retail & Shop Front Signage Hire for local and interstate use. LED Trailer Sign Hire is great for digital advertising. 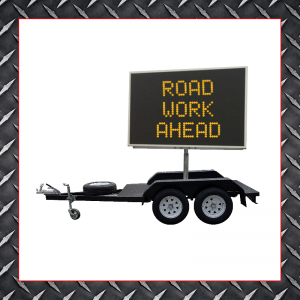 If you require one or multiple LED Trailer Signs call us on 0412 836 296 or Contact Us. 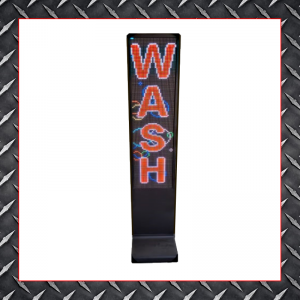 Need a quote on one or more LED Trailer Signs? Call us on 0412 836 296 or Contact Us about your LED Trailer Sign Hire needs today. Alert motorists of upcoming road works. Alert motorists of changed traffic conditions. Alert motorists of changed speed limits. Alert motorists of community events. Alert motorists of road closures. Alert motorists of an accident. Adelaide Trailer Hire offers LED Trailer Sign Hire accross all areas in South Australia, as well as for interstate use. Our competitive prices make hiring a breeze for interstate jobs or long term projects. Why Use Adelaide Trailer Hire? 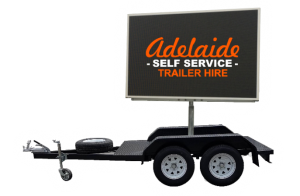 Adelaide Trailer Hire specialise in LED Trailer signs, VMS Trailer Signs and Shop Front Advertising Signs for all jobs big and small. Out team of friendly staff will help you with setting up the signs and programming the digital messages. Tags: Colour Video, Digital Signage, LED Sign Hire, LED Signage, LED Trailer Hire, Electronic Signs, VMS Trailer Sign Board, LED Colour Message Board, Variable Message Board Sign Hire. Here at Adelaide Trailer Hire we’ve recently added LED Trailer Signs, VMS Digital Trailer Signs and LED Shop Signage to our hire range. We strive to only offer the best products out there and these LED signs are no different. They have a maximum viewing distance of up to 100 metres, they display full colour images and graphics, not just text, and the messages can be changed to suit your needs. For all of you out there with a small business, running a community group or needing to advertise something in the short to medium term, you know the importance of people knowing about your business or product. Without that, you aren’t going to make many sales! And for anyone who has ever considered television or radio advertising, you’ll be well aware that these don’t come cheap – our VMS Trailers and LED Sign range could be the answer you’re looking for. Name recognition: having a presence in your local community is integral to your business success. Your signage not only puts your name in customers, and potential customers, minds, it also conveys a lot of information about what sort of business you are. Having signage that is clear, bright and easy to read gives your business a head start towards looking like it, too, is clear, bright and easy to deal with. Location: no one is going to shop with you if they can’t find you! Having signage to help people locate you can be equally as important for those who may be walking or driving past as for those who are actively seeking you out, but can’t quite find your entrance or exact location – we’ve all been given the run around by Google maps before today! Movable: the great thing about our LED signs is that they can be moved. If you happen to be tucked away out of sight or operating in a residential area then perhaps the best spot for your signage isn’t right at your front door, but at the closest intersection or road. Or perhaps you just want to be flexible in where signage goes within your yard, workshop, shop front or event. Changeable: our LED signs are changeable from a computer. This means you can change them anywhere in response to what’s happening with your business. You can update sales and promotions, mention new products or remind passers-by about what you do. This can be really useful if you want to advertise a special that has to end when you run out of product for example. As always, we’re more than happy for you to call or come in and chat to us about your small business signage needs. Our Digital VMS signs can be used indoor or outdoor and are on trailers or easy to move castor wheels, so we can help with a wide range of needs.